It was a pleasure to speak and meet with so many people and share our culture. We met so many people who have traveled to or are planning to travel to Panama. One college student even spent a year of her studies learning about the different ecology in Panama. Several people were also very familiar with Bocas del Toro, a popular tourist attraction known for its scuba diving. 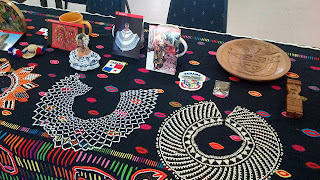 We presented a table with several artifacts, including handmade necklaces and molas from the indigenous tribes of Panama. We also showcased the famous Cafe Duran coffee, known as a staple in Panamanian culture. Make sure to mark your calendar for our next hosting day, June 23 from 12:00pm- 4:00pm.